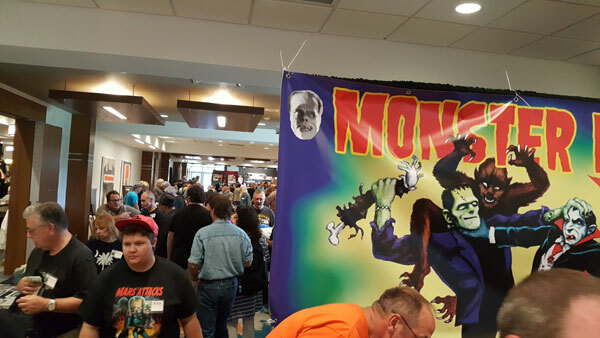 The Monster Bash this year featured Guests of Honor Ricou Browning, Gary Clarke, Gary Conway, Marian McKnight, John Babcock, Debbie Painter, Frank Dello Stritto, Tom Sullivan, Larry Storch, Terry Moore, Penny Dreadful, Son of Ghoul, Mr. Lobo, Jo Morrow, Sharyn Moffett, John Russo and many others! 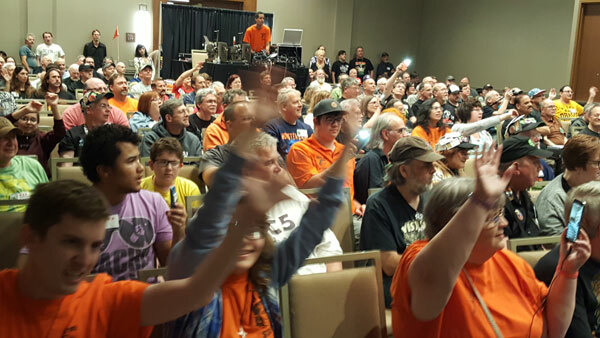 Photos provided by Ron Adams, Brian Nichols, Phil Smoot, Cortlandt Hull, Joey Vento. The Bash 2017 artwork by the great George Chastain! 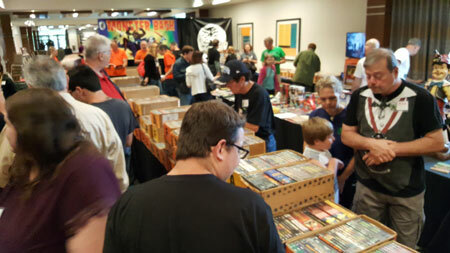 Digging for those DVDs and Blu-Rays needed in their collections at Monster Bash. Another shot of the Creepy Classics area at Monster Bash. 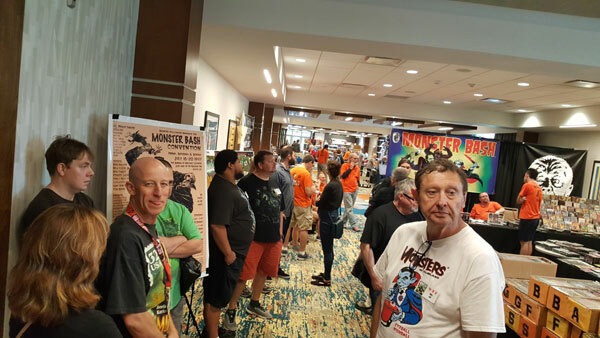 Fans of classic monster flicks from all over the country hanging out near registration, sharing stories. 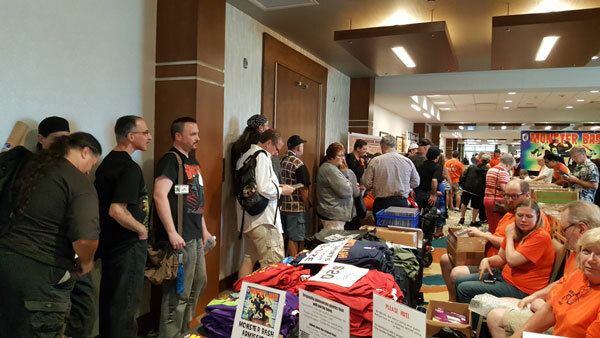 Smiles as attendees await the opening of the autograph hall. 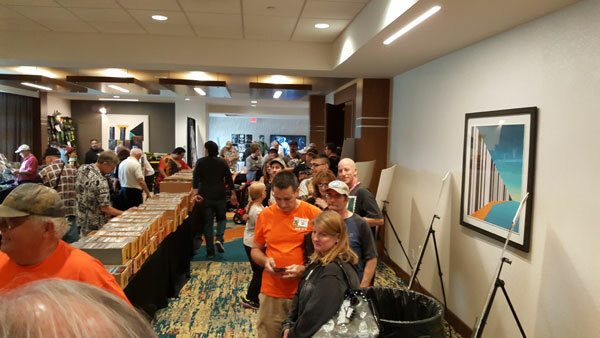 New t-shirts and attendees heading through MONSTER BASH registration. The Armellino family on duty at registion...some of the nicest people you'll ever meet. 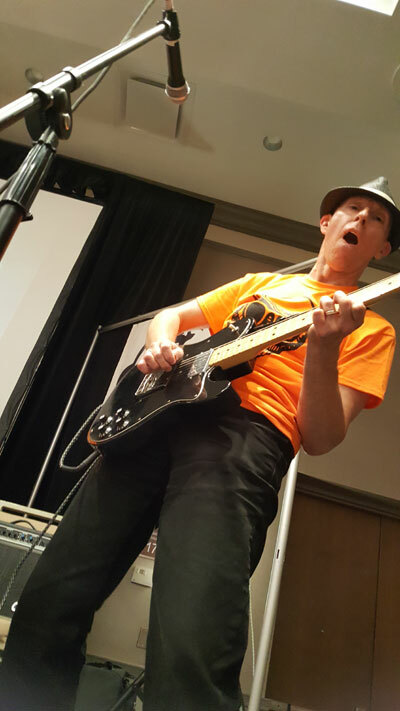 Smokin' lead guitar from Steven Thornton as "The Bash Boys" perform on Friday night. 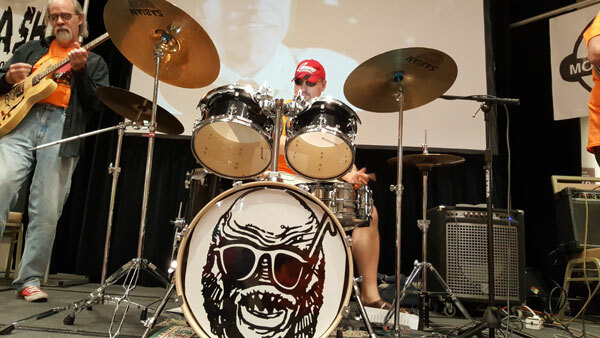 Bass guitarist Keven Scarpino with The Bash Boys....alias: TV horror host in the Cleveland/Akron area "Son of Ghoul!" 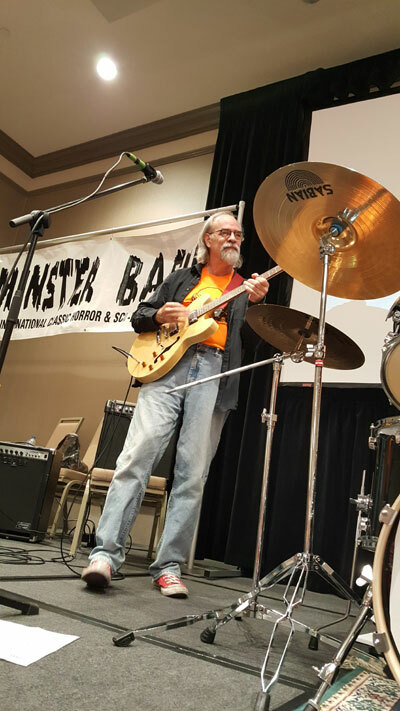 Kevin Slick on guitar, Bob Pellegrinio pounds the skins for The Bash Boys. 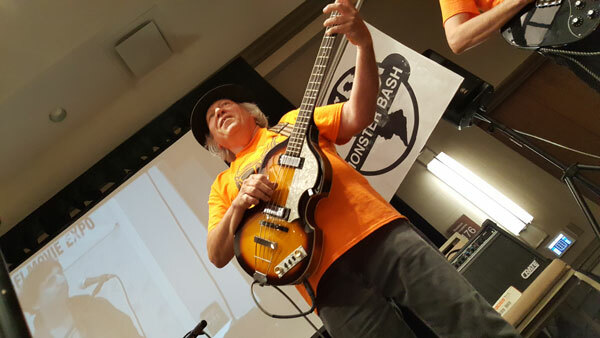 With matching orange sneakers, Kevin Slick leads The Bash Boys in some great oldies. 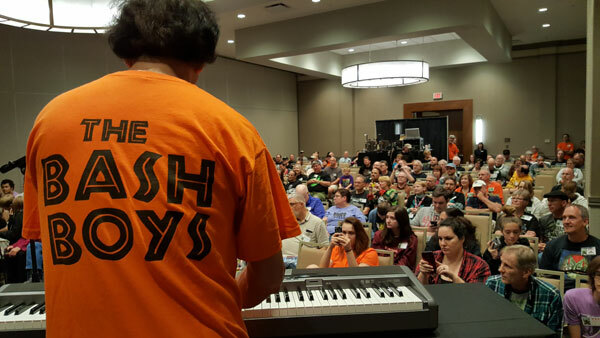 Keyboards masterfully executed by t-shirt vendor, Steve Unger. It was always monsters and music for many of us. 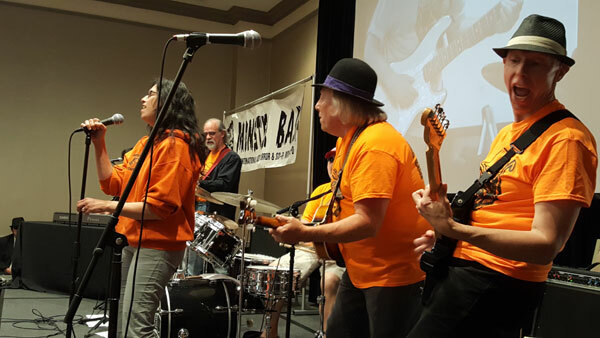 Time for some female vocals with the band, it's the gal you see at MONSTER BASH registration, Ursula Adams, "Bride of the Bash!" 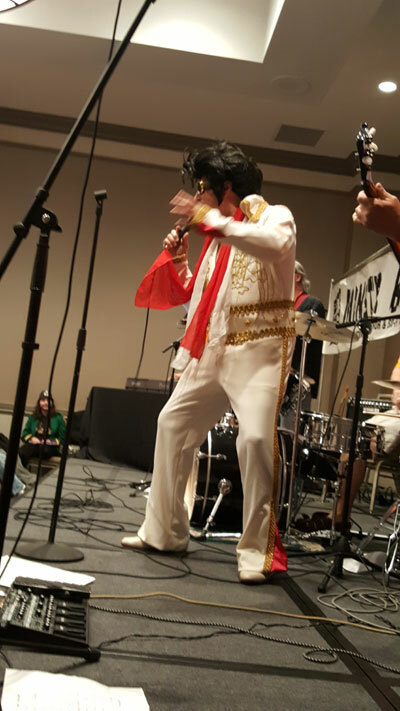 Yes, even an appearance by Elvis! 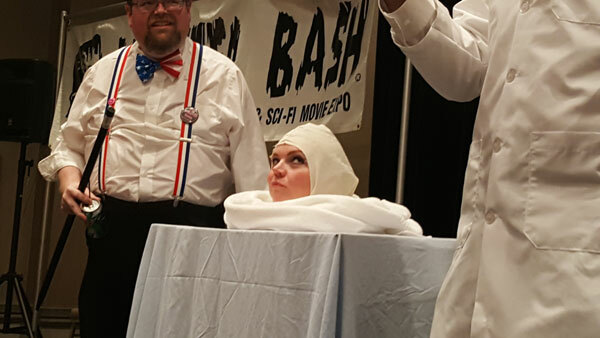 Wait....that sure looks like MONSER BASH Guest of Honor manager, Mark Statler....nah, it couldn't be. He's got it! 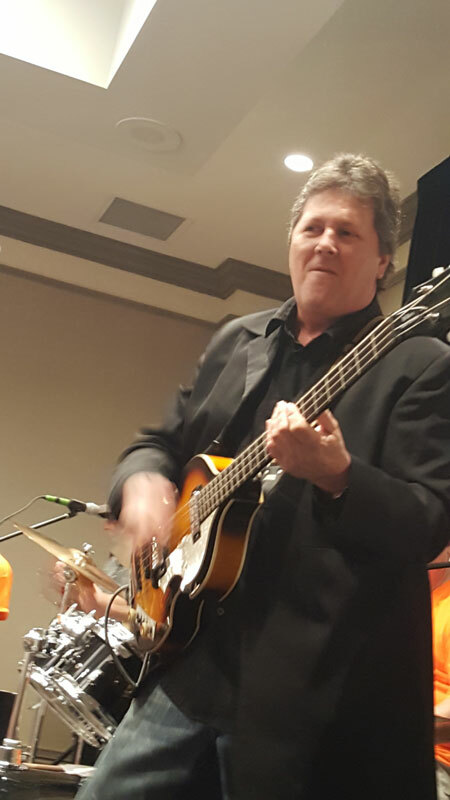 It's Beatlemania's and Disney World's Paul McCartney...John Babcock. 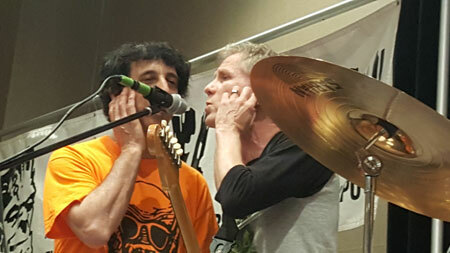 Special guest, John Babcock, thrills and chills the crowd on Friday night. We saw him standing there! 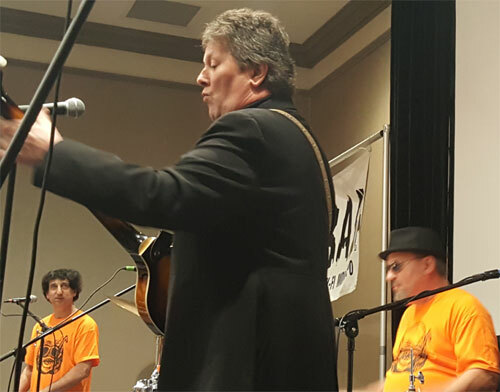 Backing vocals by George Harrison and John Lennon, I mean Steve Unger and Michael Pierce! 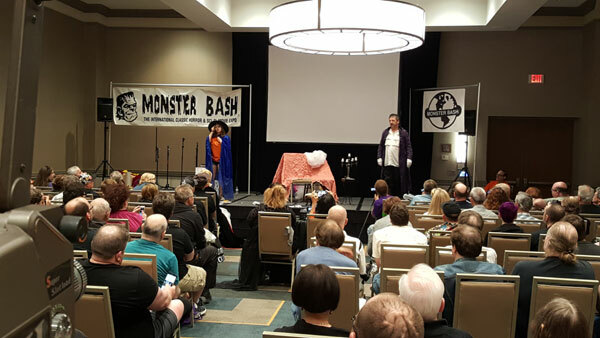 One crazy Midnight Spook Show at MONSTER BASH on Friday night. It's Leonard Hayhurst, a guest actor as a living head, and the lab coat of a mad doctor....Thom Shubilla. That's one annoyed living head. 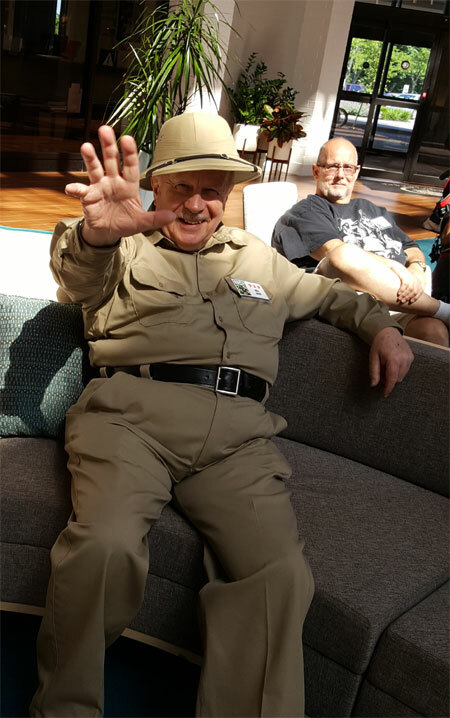 Bill Reiley (Bud Abbott) from The Ultimate Abbott & Costello Tribute Show. 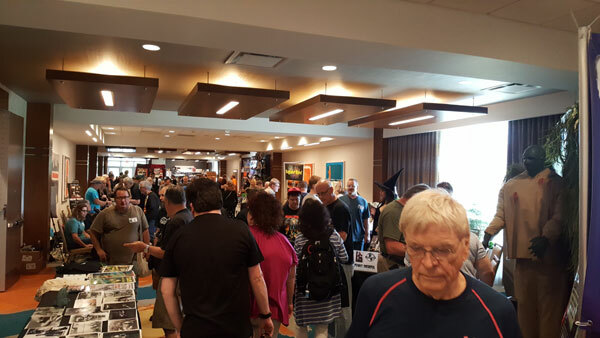 Guest of Honor signing area...that's Gary Conway (Teenage Frankenstein) in the foreground. 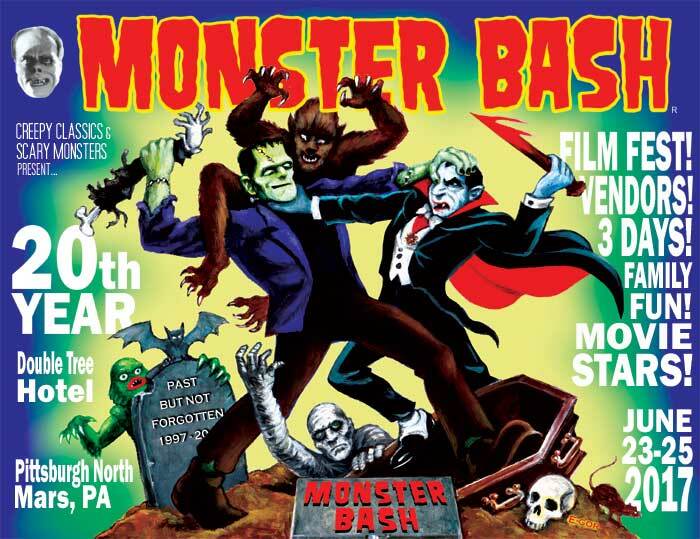 It's the celebration of classic monster movies! 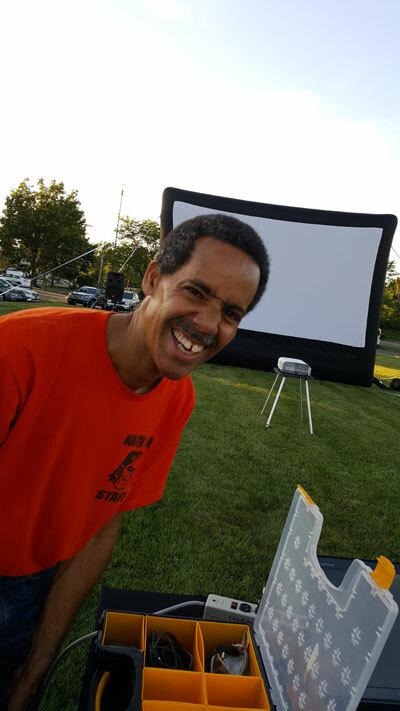 MONSTER BASH projectionist, Geoffrey Curtris, is setting up our outdoor Saturday night screening. 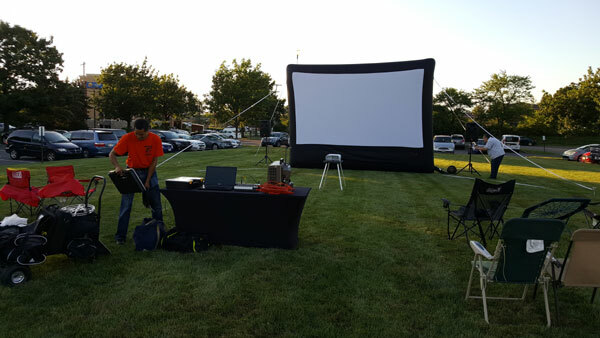 Geoffrey gets things ready....it was a perfect night, not to cold and no rain! 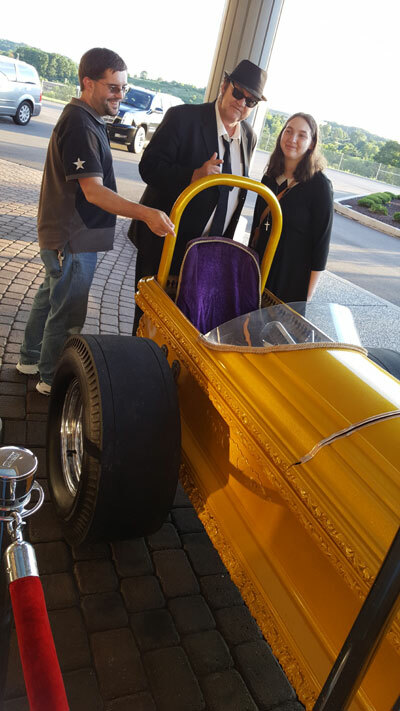 THE MUNSTERS' Drag-U-La on display. Looking on it's Martin Grams, Richard Sands and his daughter, Rachel Sands. 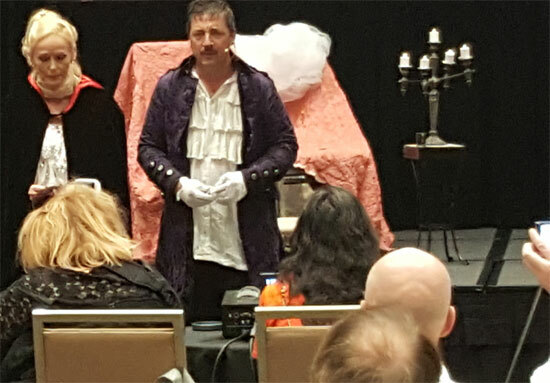 Veronica Carlson and Zach Zito in live theater for some French ghost stories. Creepy stories perfomed live....Paisley Adams and Zach Zito on stage. 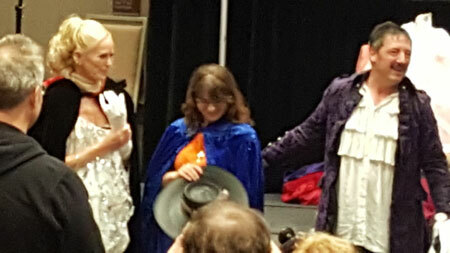 Taking bows, Veronica Carlson, Paisley Adams and the incredible Zach Zito. 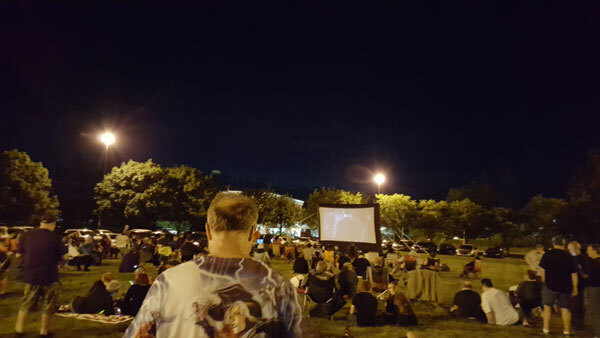 The hotel parking lot with films playing on the big screen in the distance on the grassy area. 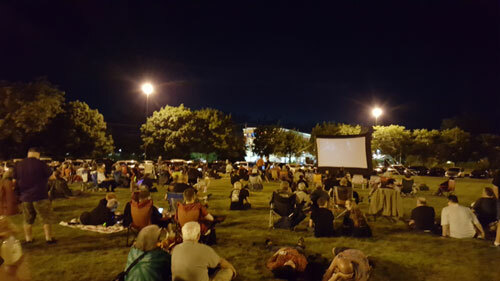 Film fans get outside Saturday night after spending two days inside at MONSTER BASH. 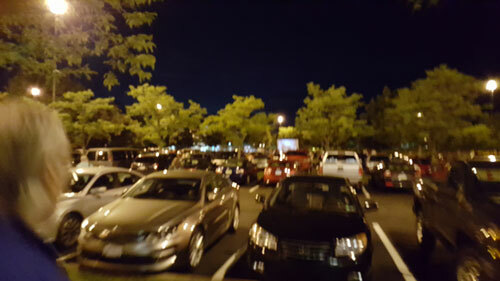 The fun nevers stops at MONSTER BASH, inside and outside on Saturday nights. 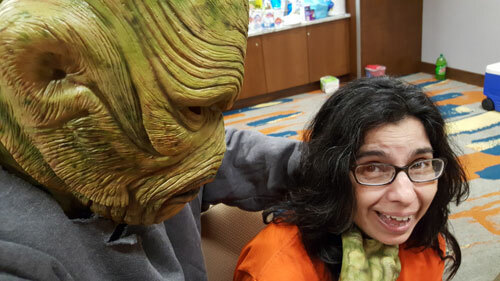 A stray Lagoon Creature walks (and chokes) among us at MONSTER BASH! 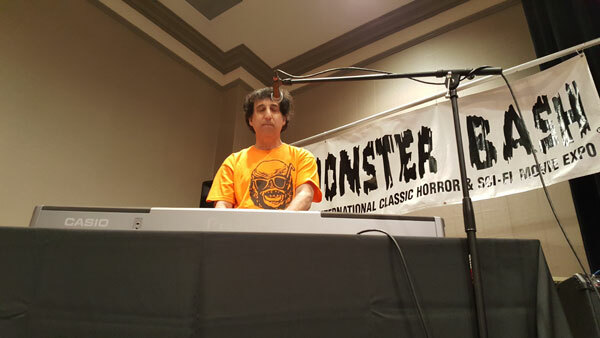 Joey Vento, as the Spook Show gorilla, really cleans-up at MONSTER BASH. 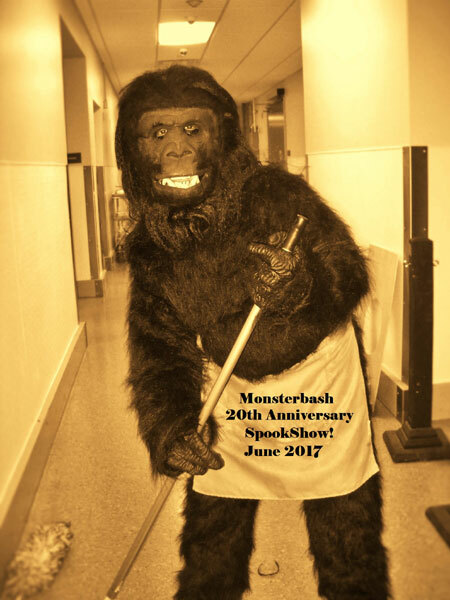 For Pictures From MONSTER BASH June 2017, CLICK HERE.